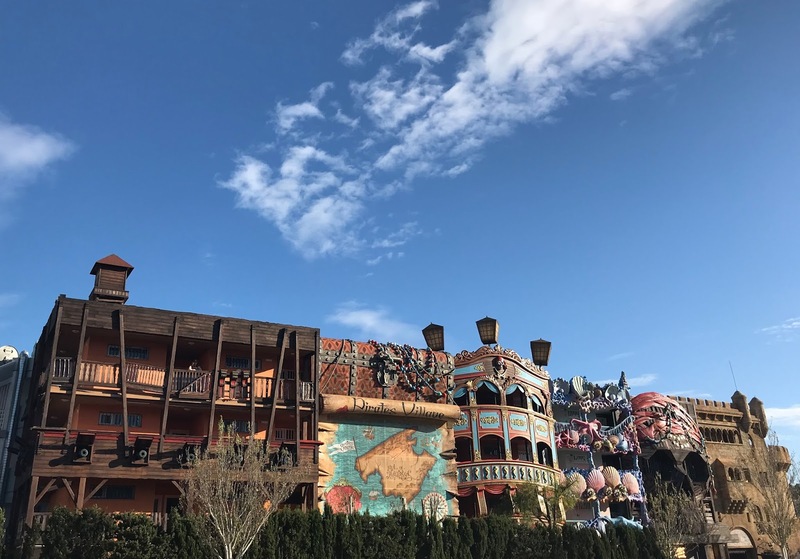 This is pretty obvious from the name of the hotel but the hotel is pirate themed, the outside is decorated all pirate like and is like nothing I have seen before with octopus, canons and treasure map facade. From the moment you pull up outside the hotel, you will be blown away, the pirate theme doesn't end there though as the inside is all decorated pirate like too, with a cave style reception area and pirate ship stage area, there is subtle pirate theming throughout the whole hotel. All of the main entertainment shows on an evening are pirate themed too, with tales such as Peter Pan, Mermaids and the legendary Sunday Pirate attack to look forward to. If you or your children like pirates then this is most definitely the hotel for you. One of the main draws to the hotel for us was the pool area, which is once again pirate themed. 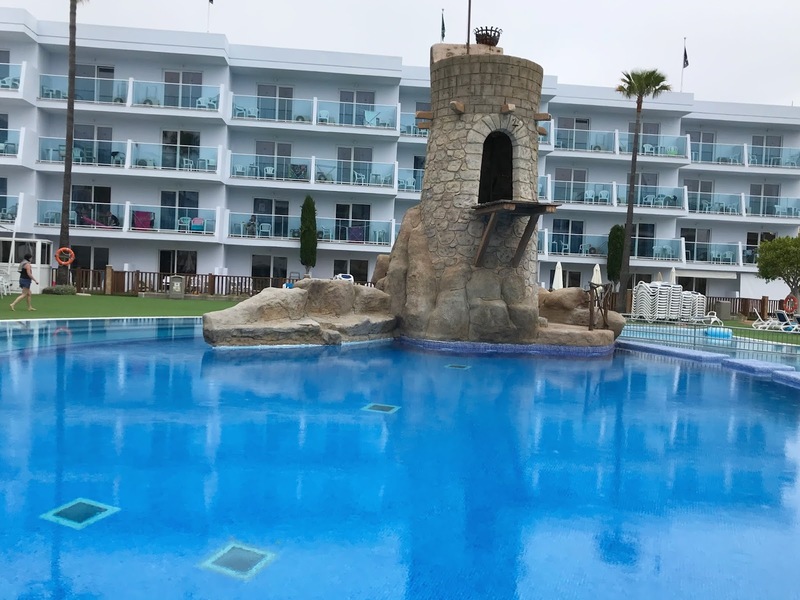 There is a main pool with a pirate tower and plank that the pirates (and some parents) jump of during shows, this pool is deep but is ideal for grown-ups and older children, around the edge of the main pool is shallow pools and paddling pools for younger children. There is also a shallower splash pool which has slides and water buckets and is lots of fun. 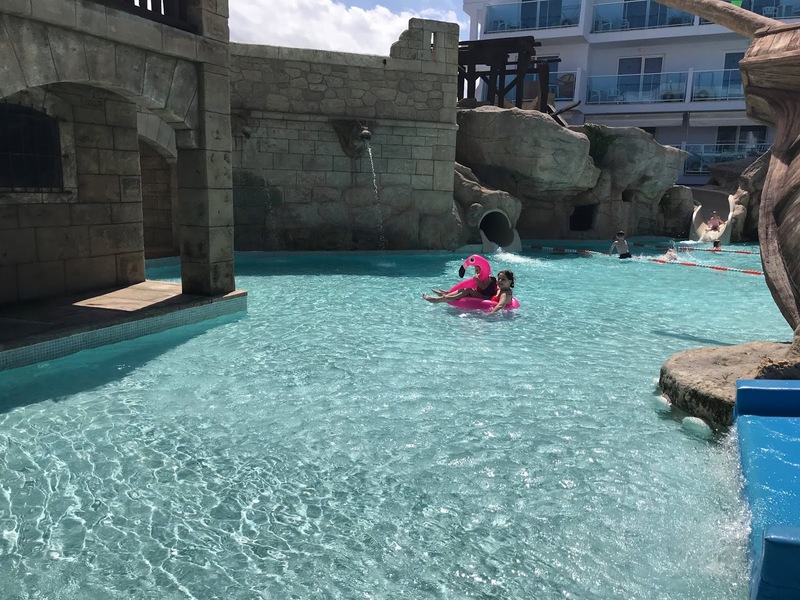 Around the whole pool area is fitted with astro-turf making it much safer for young children as they won't slip like you can on wet tiles often found around pools. There is always at least two lifeguards on duty around the pool area too to make things extra safe. The entertainment was brilliant, the entertainment staff really make you feel welcome and are amazing with the children - especially Alex who my son took a real liking too. 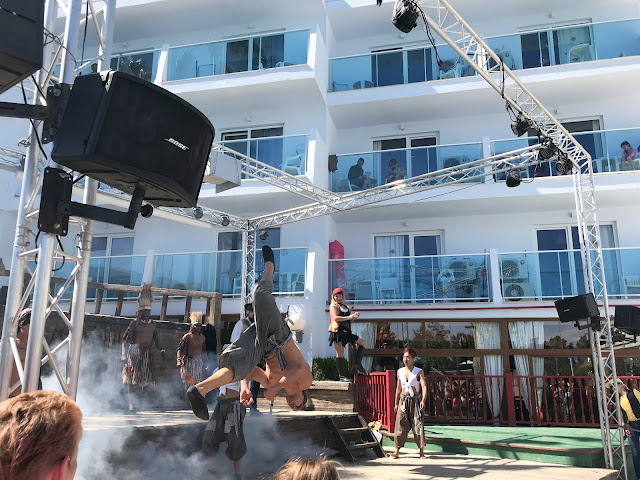 The evening shows were great and during the day the staff are always playing games such as darts, basketball or shooting as well as having water fights in the pool with the kids or even hosting Mermaid lessons. They have so much energy and are a real credit to the hotel. 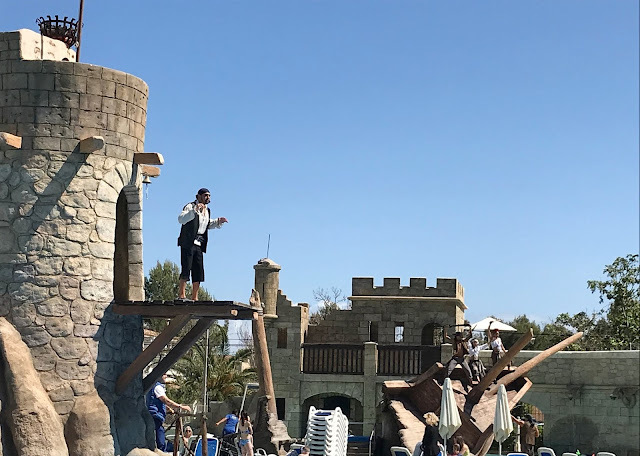 We visited Pirates Village on an all-inclusive basis, simply because we thought it would be easier with the children. 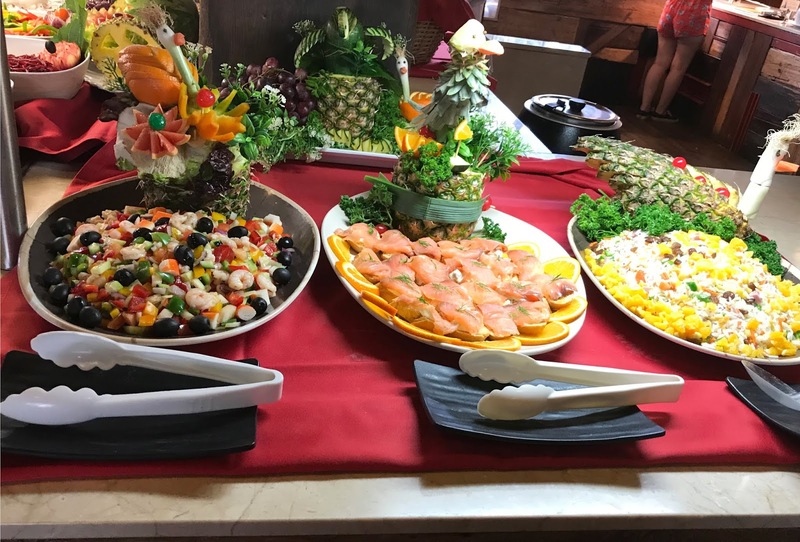 The food was much better than we expected it to be with lots of choice for both adults and children, the food was fresh and the dining area was kept spotless. We dined on freshly cooked steaks, fish and prawns on an evening whilst the children enjoyed pizza, pasta and nuggets. There was also a variety of foods and we rarely ate the same thing twice and always found something to eat, even our fussy 4-year-old. They also have a snack bar serving freshly cooked burgers, hotdogs and toasties which is included in the all-inclusive price. 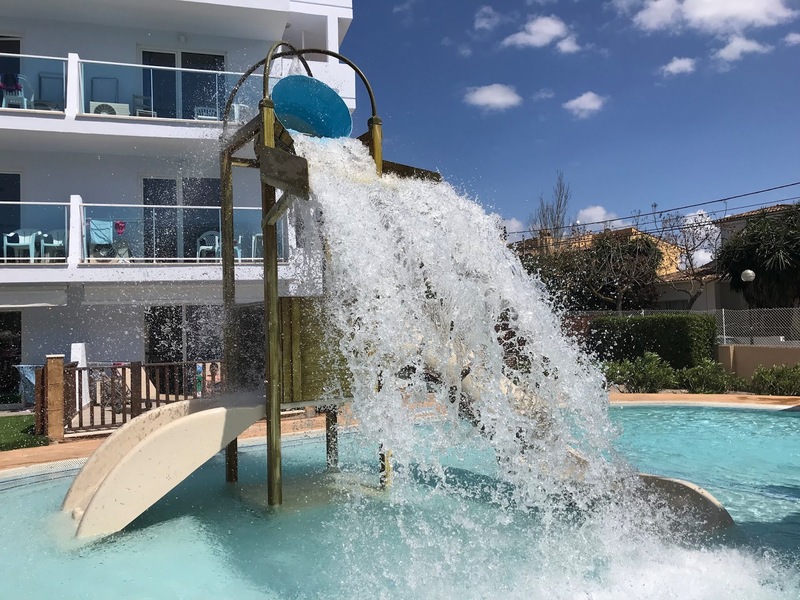 We found the location to be ideal for a family holiday with young children, Santa Ponsa is not far from the airport so it was a relatively short transfer time (about 15 minutes). You can easily head into Palma for the day by catching a bus not far from the hotel or getting a taxi. 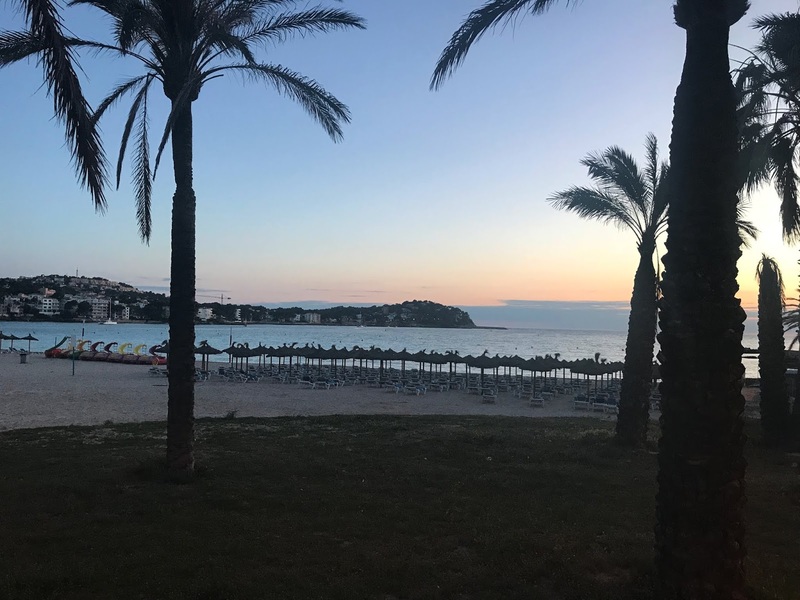 The hotel is also located in a quiet part of the resort, away from the bars but only a five to ten-minute walk to the beach, bars and nightlife. There is a big supermarket just a few minutes walk from the hotel, a lovely sandy beach with shallow water close by and the usual gift shops to browse. One of the things we really liked was that it was a small hotel, ideal for when travelling with young children. The hotel was horseshoe shaped with the pool in the centre and all rooms faced the pool area. The hotel felt secure with only one entrance and exit at the main reception area and only guests were allowed in the hotel. 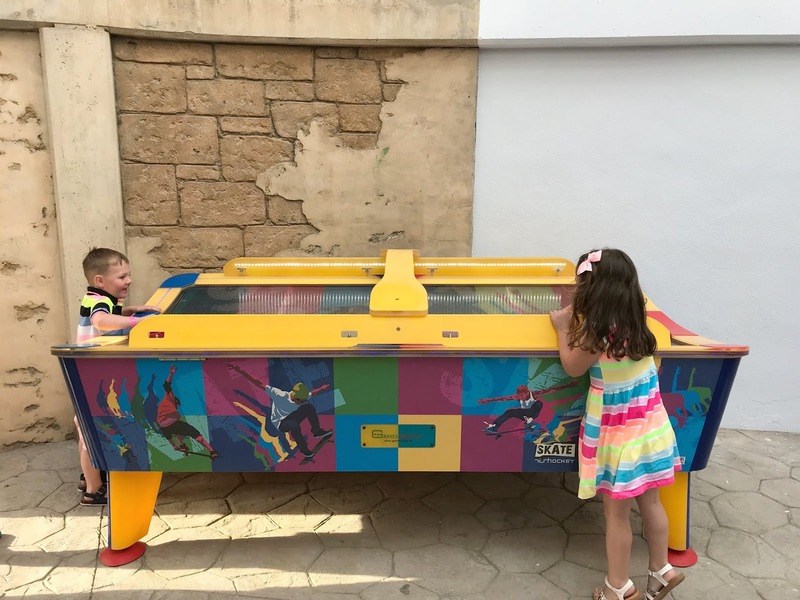 Because the hotel was so small and the way it was laid out we could easily see the children on an evening when they were dancing to mini disco or if they had ever wandered off we would have been able to spot them straight away. The whole hotel was so child-friendly and so much thought has been put into making it this way. There was always child-friendly food in the buffet section of the restaurant, lower down so children could help themselves as was the slush machine and whippy ice cream machines in the bar area. The astro-turf around the pool to stop them slipping on tiles, there was also a bathroom with mini toilets like you get in nursery schools. It was the most child-friendly hotel we have ever been too. I was adamant that I would not send the children to kids club, as I am just not a fan of them and the idea of them makes me feel anxious. However, the kids club at Pirates Village was so secure I did let them go most days for a short amount of time. The kids club is free and you don't need to book, just turn up when there was something on your kids would want to take part (the timetable is at reception). The kids club room was really secure in a locked room and you had to sign your children in and out, if the children wanted to leave they would ring your mobile for you to collect them. All the staff spoke perfect English and were lovely with the children. Sophia had her make-up done one afternoon, they watched newly released films, played on bouncy castles and trampolines, made pizzas and pirate hats and they had a really good time. As my children were only 3 and 4 when we visited they only went to kids club for an hour or so each day but they really enjoyed it. Every single member of staff we met was friendly and nice, especially the customer service manager Mo who warmly greeted us whenever she seen us. Every member of staff would say hello and smile when they saw you and make a fuss of the children even though they were always on the go. 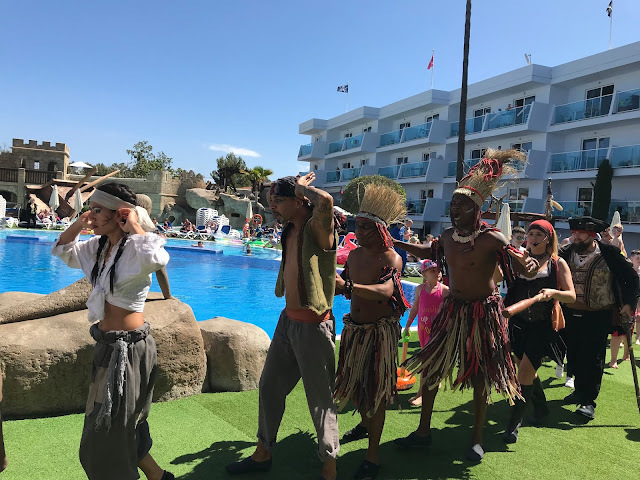 If you visit Pirates Village then I am sure you will make some amazing memories, we made memories that will last a lifetime. 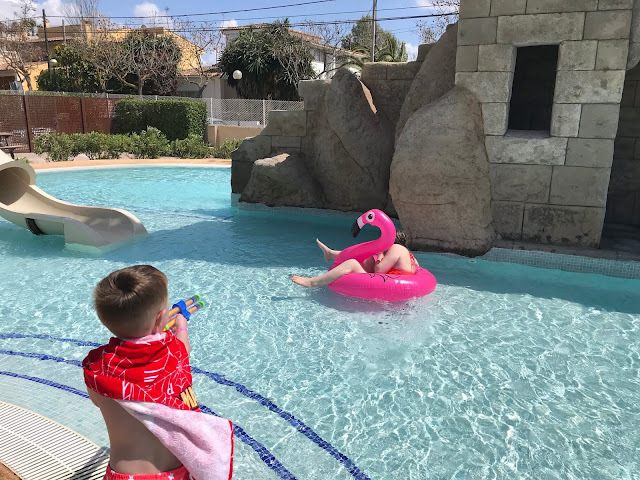 The children had such a brilliant time and that is what made the holiday so memorable, because the hotel was so child-friendly and geared towards children they had the most amazing time and seeing them happy and having fun just made the week for us. Even my teen has a great time and all three children and my other half have all asked to return someday. Oh my goodness this looks like so much fun - loving the pirate theme and the kids club sounds really excellent too. We're hoping to have a holiday abroad next year, I'll add this to my list it looks great for kids! My kids would absolutely love this!! Perfect thing to do on holiday and also nice to cool down!